BEVERLY HILLS, Calif., Nov. 27, 2018 (GLOBE NEWSWIRE) -- Rainbow Rangers, the new animated adventure series for girls, which premiered on Nick Jr. on November 5th, continues to attract new licensing partners in Genius Brands International, Inc.’s "Genius Brands" (NASDAQ: GNUS) ramp up to the 2019 U.S. retail launch of the preschool brand. 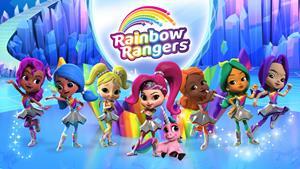 Rainbow Rangers, the new animated adventure series for girls, which premiered on Nick Jr. on November 5th to stellar Neilsen ratings, continues to attract new licensing partners in Genius Brands International, Inc.’s "Genius Brands" (NASDAQ: GNUS) ramp up to the 2019 U.S. retail launch of the preschool brand. Genius Brands’ SVP of Global Licensing Lloyd Mintz announced today that the Company has signed four new licensing partners, including Cra-Z-Art for crafts and activities; Esquire Footwear for shoes and footwear; Integrity Vitamins, for developing a line of chewable, all natural, vegan, gummy vitamins for kids based on the colorful Rainbow Rangers characters; and Townley Girl, for a line of age-appropriate cosmetics and a variety of health and beauty products. Genius Brands has partnered with over 25 blue-chip industry-leading licensing partners for the retail launch of Rainbow Rangers, including Mattel Inc. (master toy), MacMillan Publishing (master publishing), Bentex (master apparel), A.M.E. (sleepwear), Berkshire Fashions (cold weather accessories), BioWorld (bags, backpacks), Ceaco (puzzles), Disguise (Halloween costumes), Handcraft Manufacturing (packaged underwear), H.E.R. Accessories (jewelry and hair accessories), Jay Franco (bedding and bath), Dynacraft (bicycles), Kid Galaxy (bubble toys), Kiddieland (foot-to-floor ride-ons), Planet Sox (hosiery), Spirit Halloween (direct-to-retail program), KIDdesigns (youth electronics line), and Basic Fun! (novelty toy line). Boasting a unique and highly-accomplished team of creators from the animated motion picture world, Rainbow Rangers’ creative development and production team includes Rob Minkoff (Disney’s The Lion King director), Shane Morris (Disney’s Frozen co-writer), Tim Mansfield, and New York Times Bestselling author and Emmy-nominated writer Elise Allen (Dinosaur Train, Lion Guard, Barbie specials) who is serving as head writer and co-creator. Genius Brands’ Chairman and CEO and multiple Emmy Award-winning producer of more than 5,000 episodes of children's programming, Andy Heyward, serves as executive producer, with legendary Disney alum Ruben Aquino creating key designs. Aquino is responsible for the design and animation of many of Disney’s most iconic characters from award-winning films including The Lion King, Beauty and the Beast, The Little Mermaid, Mulan and Frozen.